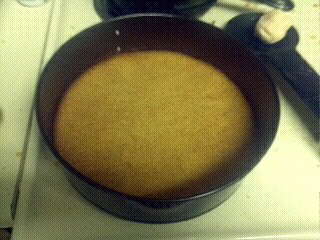 First attempt at blogging from my phone AND making a cheesecake! Will update with photos and a recipe once it's finished! Preheat oven to 350* Place cupcake liners in a muffin pan. Beat the cream cheese until creamy. Add the sugar and cream again. Add the eggs one at a time beating after each one. Add the rest of the ingredients and beat again. Place one whole oreo in the bottom of the cupcake liners and fill up the liner 3/4 full with the cheesecake batter. Push another whole oreo into the top of the batter. Bake for 20-22 minutes. Cool in pan for 15-20 min before removing and placing on a wire rack to finish cooling. Keep refrigerated. Top with whipped cream and oreo sprinkles before serving. Makes 24. Stop what you are doing right now and GO MAKE THESE CINNAMON ROLLS!!!!!!!!! I made them for a bake sale at work, and haven't heard a complaint yet. :) I saved a few "ugly" ones for myself and it was the best breakfast I've had in a while! They are pumpkin-y, but not over the top. If you're looking for something different, this is definitely it. I will be making these for years and years to come--no joke! 1. 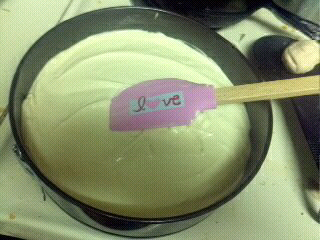 In small saucepan, heat milk and 2 tablespoons butter just until warm and butter is almost melted, stirring constantly. (I did this in the microwave and it worked just fine.) In large mixer bowl, combine pumpkin, sugar, nutmeg, pumpkin pie spice, and salt. Add milk mixture and beat with electric mixer until well mixed. Beat in egg and yeast. 3. Cover and let rise in warm place until doubled, about 1 hour. (I like to run a kitchen towel under really hot water, ring it out, then place it over the bowl. This keeps some heat inside the bowl and helps the dough rise.) Punch dough down. Spray a surface with cooking spray or turn onto floured surface. Knead a few turns to form a smooth dough, sprinkling with enough additional flour to make dough easy enough to handle. (I used a ton of flour to knead the dough--just keep adding flour until it's not as sticky and makes a nice smooth ball of dough.) Roll dough into 12x10 inch rectangle. Transfer to small mixer bowl and cool mixture. Stir in vanilla, pumpkin pie spice, salt, and confectioners' sugar. Beat with electric mixer until well blended. If necessary, add more confectioners' sugar for desired consistency. This recipe comes from my mom. I'm not sure where she originally got it, but these are one of the things I always remember her making when I was younger. They are my dad's favorite breakfast item and our whole family always fights over who gets the last ones! My sisters and were always quick to tally up who had how many so no one would get more than the other! :) They are so good and very easy to make!! 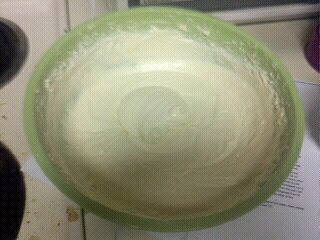 Put shortening, sugar and egg in a mixing bowl. Beat well. Mix together flour, baking powder, salt and nutmeg and add to the first mixture. Pour in the milk and beat until blended and smooth. (I usually “alternate” the flour and milk until I use it all versus putting all of flour in and then all of milk in). Fill muffins 2/3 full. Bake about 20 minutes (depending on your oven). For topping – as soon as puffs are done, remove from pan and dip the tops, one by one into melted butter and then dip in cinnamon-sugar mixture. I made this tonight and it was amazing. I was a little weirded out by the way you make it, but it worked and was so easy!! Basically you make a batter (similar to a brownie or chocolate cake batter) and pour/spread it into your pan. Next, you mix up some brown sugar, sugar, and cocoa powder and sprinkle that on top. Then, you just pour 1 1/2 cups of hot tap water on top of everything (without stirring it up!) and put it in the oven for 40 minutes. It comes out like a brownie with a crunchy top oozing with this chocolate lava. SO GOOD!!! We didn't have any ice cream, but it would be amazing with some vanilla ice cream right on top!! 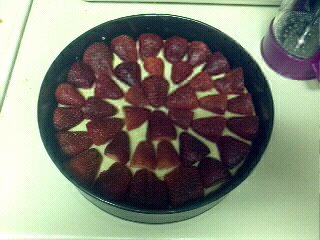 I'll definitely be making this again! 1. Decorate the front door with the Dharma symbol, like you're walking into The Hatch. 2. Plaster all the foods with Dharma labels... Dharma crackers, chips, beer, beans, peanut butter, etc. 3. Have buckets full of airplane-sized liquor bottles, just for the occasion. 4. Make airplane shaped cookies and make yummy flavored cupcakes simply decorated with "the numbers." Also, possibly a coconut cake (in keeping with the "island" theme!) decorated with the Dharma symbol. 5. Use this as inspiration for my invites. 6. Serve KFC buckets of chicken, but replace the labels with Mr. Cluck's Fried Chicken. 8. Each guest picks up a lottery ticket at the door, and at the end, we draw numbers for a door prize (possibly a stuffed polar bear??). 9. This is out there, but maybe try to rig up a simple command-line program that asks for the numbers every 108 minutes. Run it in a full-screen green-on-black terminal window and cover your return key with the word "execute." I'd definitely need some help with that one. HA! 10. Have some games set up like Backgammon, Connect Four, etc. 11. Black and white stones everywhere. You may remember my post about the secret to making the best mac & cheese. (You can find it here.) Well, I tried out a different recipe tonight and it was just as good--if not better. I used Monterrey Jack cheese (bought in a block and shredded myself) which gave it a little kick. And when I say little, I mean little--Matt didn't think it was spicy at all and I could taste the spice, but didn't think it was spicy if that makes sense. It also uses Worcestershire sauce which I thought was interesting. It didn't take too long to make, but there were a lot more steps than the other recipe, where you basically throw everything into a pot until it thickens up. I will have to try out my original recipe with Monterrey Jack cheese before I decide which one I truly like the best. We shall see. In the meantime, here is the recipe (my notes in italics). If you're stuck in a mac & cheese rut, try this--you won't be disappointed! One other thing: I did not bake it at the end. For one, I am too impatient and I was hungry! Second, I don't always like the taste of baked mac & cheese. If you like it baked, then go for it! Stir in flour, salt, pepper, ground mustard and Worcestershire sauce. Cook over medium-low heat, stirring constantly, until smooth and bubbly; remove from heat. Add cheese. Cook and stir until cheese is melted. Add some extra shredded cheese to cover top. Bake uncovered for about 25 minutes, until bubbly. Broil for a few minutes, until cheese on top browns. My name is Ashlee & I love to bake. My boyfriend loves to cook, so it works out nicely. :) I started this blog to document all the new recipes I try, good & bad. Enjoy!